“Our GPS tracker just didn’t work,” said a disappointed business owner. “It never did what it was supposed to do because it turned off half of the time!” What was wrong with the GPS tracker? Well, it turned out that the device itself wasn’t necessarily the problem. The business just needed a tamper proof GPS tracker. The business owner thought that their GPS tracker was a winner. After all, it was cheap and it was installed in just under 2 minutes. However, the quick install might have led to the problem – the device was fragile and was far from a tamper proof GPS tracker. In fact, the owner later found out that employees unplugged the devices whenever they did not want to be tracked. They would then replug the device. This left the owner to wonder – what are some good tamper proof GPS tracker alternatives? A popular alternative is hardwiring. 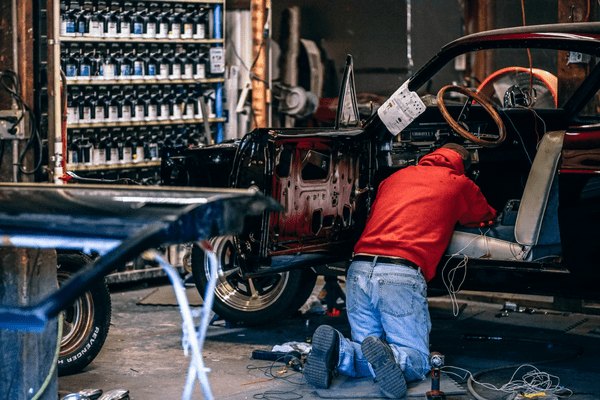 Hardwiring is when mechanics install wires within the vehicle. What are the advantages of hardwiring? For a long time, hardwiring was the go-to tamper proof solution. Since the solution was part of the vehicle, employees cannot tamper with tracking by unplugging a device. Time. The vehicles need to visit a installation shop. It might not be feasible to do every single vehicle at once, so businesses tend to install the fleet in phases. As a result, the process could take several weeks to complete. Cost. Some hardwired solutions can have upfront costs of over $1000/vehicle. Hardwired solutions are typically more costly because businesses need to pay for both hardware and installation. Installation risk. Hardwiring requires a high level of technical skills. Businesses must ensure that the installer is certified in order to mitigate vehicle damage risk. Another alternative is using tamper proof plug and play solutions. Over the past few years, a lot of plug and play solutions developed anti-tampering hardware and software. 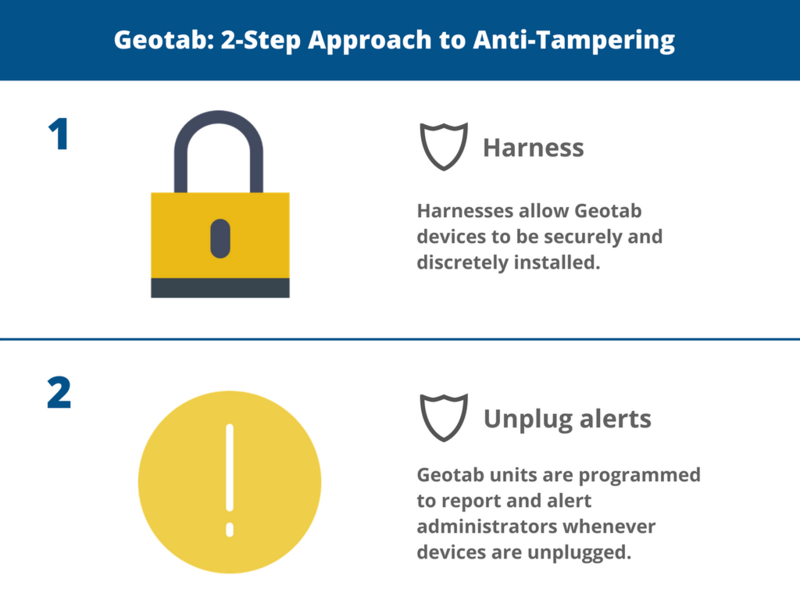 For example, Geotab systems have two powerful anti-tampering measures. Harnesses are anti-tampering superstars. Harnesses hide the tracking device under the vehicle’s hood and away from open view. As a result, the system is protected against accidental kickers or deliberate yankers. Let’s say a mischievous employee gets creative. They go under the hood, find the device, and use a tool to remove the device. Can they get away with it? No. Another precaution against tampering is setting up unplug rules. This is a handy alert and report system where all unplugs are documented. As a result, administrators can quickly see if anyone is tinkering with the device. 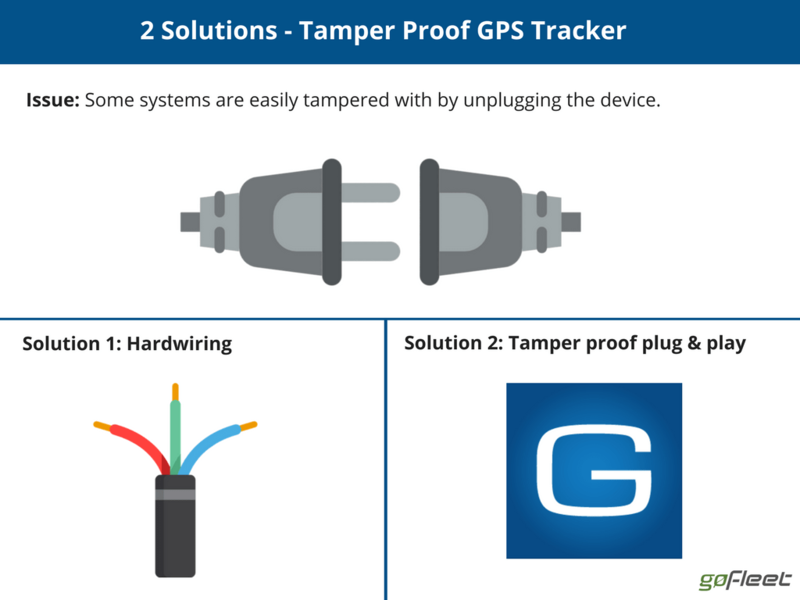 With both a harness and an unplug alarm, Geotab is a tamper proof GPS tracker system. Tampering with the system makes no sense! It’s almost like a staff member walking up to their supervisor, blindfolding them, then trying to walk out the building – probably not a great ending for that employee! Looking to install a tamper proof GPS tracker? Check out Geotab’s Harness Guide!